Here we go again, Silver Age fans. We’ve lost another great. On August 23, 2018, the great Russ Heath caught the last train out at the tender age of 91. I didn’t get as close to Russ as I had some of my other interviewees, but he was certainly generous with his time during that two-parter [Sage #186 & #187] that I had the privilege to conduct back in December of 2007. I made an attempt to commission him once, requesting a simple head sketch of the Lone Ranger, hearkening back to the time he and writer Cary Bates were doing the syndicated strip, but he never managed to get around to it and my check was never cashed, so I guess that was a missed opportunity, although I do have an original sketch by Russ. Oddly, I’m currently struggling to remember just how I got it. 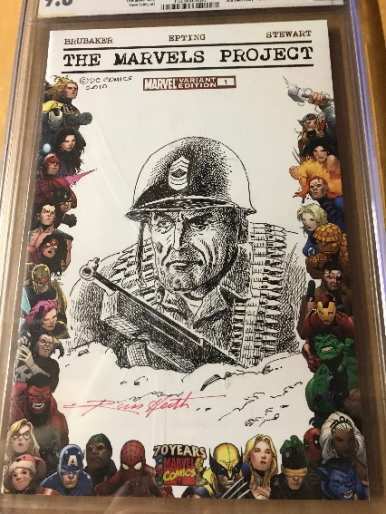 It seems like there was some sort of auction to benefit maybe the Hero Initiative? I just can’t quite glean the details from my cranium right now, but other than the fact that it’s slabbed, which I guess is okay for a sketch. I mean, at least you can enjoy it, but it’s kind of odd and ironic that it was done on a blank Marvel book. I’ve left it in the slab for protection and for an easy reference to when it was done in 2010. I’m glad I have it. Ironically, I was at my local comic shop yesterday, looking through the bargain boxes and nearly picked up a couple of old Sea Devils books, but then spotted something I was more interested in. Perhaps I’ll go back soon to see if they’re still there. Russ was, of course, best known as one of the Big Five war book artists and it was on that merit that I had my one and only chance meeting with him at the San Diego Con in 2015. He happened to be on the floor (unfortunately in a wheelchair) when I happened upon him. I’m sure he didn’t remember me from third base, but I got to shake his hand and thank him for both the interview and his abundant and excellent work over the years. Long time readers of this feature may recall that one of the books I reviewed in conjunction with the 2-part interview that Russ illustrated prominently featured a two-page splash with an incredibly detailed German tank on it. Well, as luck would have it, I happen to have another stellar example of Russ Heath draftsmanship in my collection. 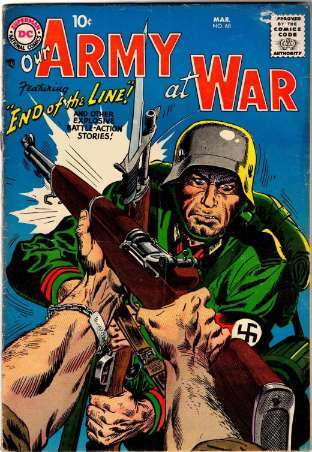 It’s a reprint that originally appeared in Our Army at War #68 from March of 1958 with editing credit by Whitney Ellsworth, but the Grand Comic Database clarifies that it was actually Bob Kanigher. The script for “Combat Log Book!” was done by Ed Herron with Russ on pencils and inks and the copy I have is in issue #135 of Our Fighting Forces from January/February of 1972. So, check out that splash page (original and reprint) with another stunningly realistic drawing by Russ, this time of a North American P-51D Mustang fighter plane. Holy cats is that a beautiful piece and I’m highly envious of whomever owns the original. 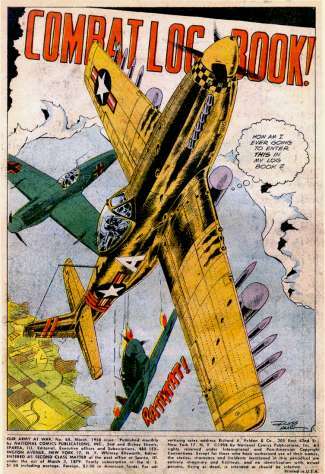 On to this short but sweet 6-page story, where we follow the pilot of that Mustang as he’s in full aerial combat with enemy Messerschmidt’s. While he’s fully engaged in the action, he’s also pondering just how you do a log book write-up for the mission within space constraints. His thoughts unceasingly race as he encounters yet another obstacle. Anti-aircraft fire from familiar figures in coal scuttle helmets decorated with swastikas. A strategic dive followed by a bomb release clears out the targeted bridge and a successful mission is complete. 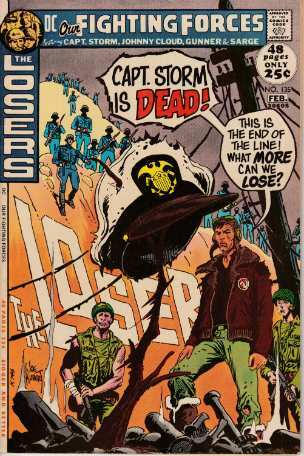 As I said, a short but sweet 6-pager with some unnamed fliers as the main characters, although I would argue that the real star was Russ Heath’s artwork, particularly on the panels featuring the Mustang. That alone was well worth the price of admission. It’s not really fair to try and rate a distinctly separate genre, such as the war books, but a Russ Heath story is always a cut above. 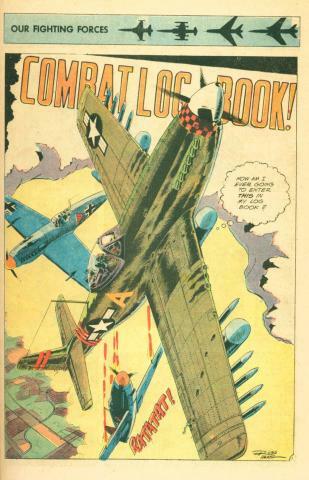 Russ Heath’s stellar draftsmanship was not, of course, limited to the combat action books, although his work there was impressive and voluminous. 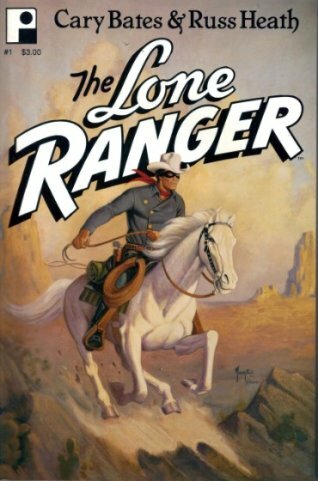 His adventure and western work are equally detailed and brilliant and thankfully there’s a large body of it to be enjoyed by all of us who hold the Silver Age dear in our hearts. Farewell, Russ and thanks for your many contributions to the genres we love! Hopefully next time around we’ll be back to a standard review rather than one that includes a tribute to a fallen creator. Remember to make yourself heard with opinions or queries. My e-mail is at your disposal: professor_the@hotmail.com.